Product information "Shimano Gear Cable Set SIS-SP41 black"
Original Shimano MTB shift cable set in black colored design. SIS-SP cable housing are axially stiffer and stronger than SIS cable housing. This is achieved through the use of longitudinal steel wires that take the place of the usual helical coil (as it is found in brake cables). Forces are transmitted directly. The switching process takes place spontaneously and with higher precision. SIS housing components can be replaced by SIS SP cases. 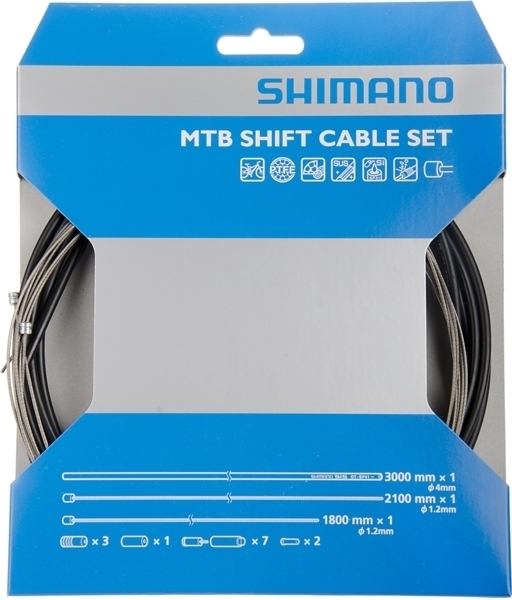 Original Shimano MTB shift cable set in black colored design. Related links to "Shimano Gear Cable Set SIS-SP41 black"
Customer evaluation for "Shimano Gear Cable Set SIS-SP41 black"